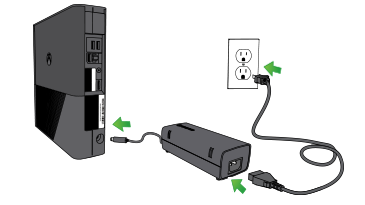 Unplug the power supply from the power point, and then unplug the short cord from the power supply. Plug the power cable back into the console, and then plug the power cable back into the power point and the power supply. Make sure that all three power supply connections are firm. Turn on the console and check the light on the power supply. Solid green or solid orange light: Your power supply is working. If your console won’t turn on, try our Xbox 360 No Power Solution. If your power supply light is still flashing orange, solid red, or unlit, your power supply needs to be replaced. You can order a replacement Xbox 360 power supply from our Xbox Online Service Centre. Console registration is required to replace the power supply under warranty (the power supply warranty is the same as your console warranty). Would you like to contact Support regarding the "Check the Xbox 360 power supply" issue you were reading about or a different issue?